Water spray provides an adiabatic cooling effect on the incoming air stream. 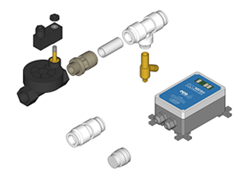 The water spray can be initiated via an ambient sensor or alternatively by refrigeration head pressure override i.e. condensing pressure limit. As soon as these settings exceed a pre set level the EcoMESH controller initiates intermittent water spray in order to lower the air on temperature for the condenser, hence the condensing pressure can be lowered in order to save energy during high ambient periods. EcoMESH is a non metallic mesh which provides the most effective coverage area for an efficient evaporation surface with minimal pressure drop. EcoMESH can fit any model, make or size of Mini Split, Rooftop, Air Cooled Chillers, Condensers, Air Inlet cooling and Dry Coolers. Sectional mesh panels can be joined together to form a full mesh area or alternatively flexible mesh roll can be cut to fit a required size in front of the heat rejection surface. In the event of a panel section becoming damaged they can be easily replaced. The water system to create the spray is designed to operate with very low pressure and they can operate with normal mains water pressures 1.5 Barg (21 psig) / (15m) and above. In order to provide uniform coverage area for an effective evaporation process the quick change plastic nozzles can be connected in either series or parallel arrangements. Spray nozzles are mounted onto the custom made fixing brackets which are designed to match any coil configuration. Fixing brackets can be fixed on to the fan baffles and attached to the bottom of the unit with flexible straps in order to provide an arch form between the coil and mesh area. A bespoke intelligent PLC based controller records the ambient conditions and at an adjustable pre set value initiates the inline solenoid valve(s). Water is sprayed intermittently to wet the meshes and the spray rate and duration are automatically adjusted by the controller to suit the ambient conditions, thus minimising water consumption. Water usage is through a total waste principle, therefore no health risk issues. The controller is provided with internal override terminals for a volt free input which overrides the temperature set limit and initiates intermittent spray as soon as this terminal is linked. This facility can be used to provide head pressure or manual remote override flexibility.